Stevia Leaf, Organic Maple Syrup Powder. Mix one level scoop of Vegetable Greens into 8 ounces of water or your favorite juice. Consume one serving daily or as recommended by a health care professional. Refrigerate after opening. Everyone wants to look good, feel better, and have more energy. Yet we often overlook simple dietary changes that can provide our bodies with the nutrients they need to achieve the goals we want. A large body of scientific literature suggests that the consumption of a diet of whole grains, legumes, vegetables, nuts, and fruits along with a regular exercise program can help you live a healthier lifestyle. Even with the best of intentions, few of us eat the recommended five to eight servings of fruits and vegetables everyday. Even the most sensible diet may still lack a number of vital nutrients important to good health. Also, the foods we eat impact the delicate acid/alkaline balance of our bodies. Factors, such as stress, can increase the level of acidity within our bodies. By contrast, most fruits, land and sea vegetables, herbs and spices are alkalizing, which can help to bring our systems back into balance. Your body needs Essential Fatty Acids (EFA's) just like it needs other essential vitamins and minerals. Essential fatty acids play a role in everything from carbohydrate metabolism and proper immune function, to brain and cardiovascular health and energy production. Essential fatty acids regulate a large number of mechanisms including increasing the fluidity of cell membranes and improving their "gate-keeping" abilities. These mechanisms help keep toxins out and bring nutrients into your cells. Essential fatty acids also influence the activation of cell genes, act as second messengers and produce good eicosanoids. Studies suggest green foods well established, health-enhancing effects, including: boosting of levels of good bacteria (such as Lactobacilli) and boosting of immunity. Green food concentrates such as barley greens, alfalfa, buckwheat, spinach, wheat grass and aloe vera help to balance the body's pH level, offsetting the acidity caused by many environmental factors. In addition to its nutritional value, green foods detoxify our bodies of unwanted metals and impurities. Ounce for ounce sea vegetables are higher in vitamins and minerals than any other food group. They are particularly high in vitamins A, C, E, B1, B2, B6, and B12. Seaweed also contains ergesterol, which converts to vitamin D in the body. In addition to key nutrients, seaweed provides us with carotene, chlorophyll, enzymes, fiber and iodine. Seaweed's saltiness comes from sodium, potassium, calcium, phosphorus, magnesium, iron, and a multitude of trace minerals found in the ocean. Spirulina also has phycocyanin, a powerful antioxidant. Land vegetables are rich in vitamins, minerals and phytonutrients and have powerful antioxidants. In the last few years, phytonutrients have been getting greater attention, as more and more research uncovers just how powerful these nutrients are for our health. Cruciferous vegetables such as broccoli, cauliflower, brussel sprouts, kale and watercress are rich in glucosinolates, compounds that break down into indoles and isothiocyanates (ITCs). Of these isothiocyanates, sulforaphane and sinigrin are most commonly known. The unique components of cruciferous vegetables assist the body in detoxification and preventing oxidative cell damage. The Standardized Herbs in Vegetable Greens work collectively to help strengthen the immune system, act as powerful antioxidants, and energize the body. The active ingredients in cranberry include chemical compounds called proanthocyanidins; potent antioxidants that decrease bacterial adherence to the bladder epithelium cells. Dandelion root has properties that can detoxify the body. Polysaccharides from Astragalus are used in the enhancement of the immune system by the use of glyconutrients. Fiber acts as a broom, sweeping the inside of the colon, taking with it all the toxins and free radicals with it. Inulin, along with other dietary fiber, has been shown to promote regularity. Scientists have suggested that inulin and other fibers have potential health benefits that include improving or maintaining colon health as a prebiotic, increasing the absorption of minerals, particularly calcium, and improving immune function. As a dietary fiber, apple pectin is helpful in maintaining good digestive health. Fructooligosaccharides, a prebiotic fiber, ferments in the lower digestive tract, acting as a food source to the beneficial microflora that reside there. Enzymes promote absorption and assimilation. The importance of digestive enzymes resides in the fact that the human body cannot absorb nutrients in food unless digestive enzymes break them down. Black pepper extract then enhances the absorption of the nutrients through the intestine. This ensures that we get the greatest possible nutritional value from foods. 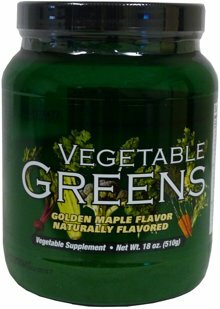 Ultimate Nutrition Vegetable Greens is a formulated combination of over 62 phytonutrients from herbal extracts, prebiotics, probiotics, plant enzymes, essential fatty acids (EFA's), super green foods, and land, sea and cruciferous vegetables. Vegetable Greens is dairy-free and is suitable for vegetarians. 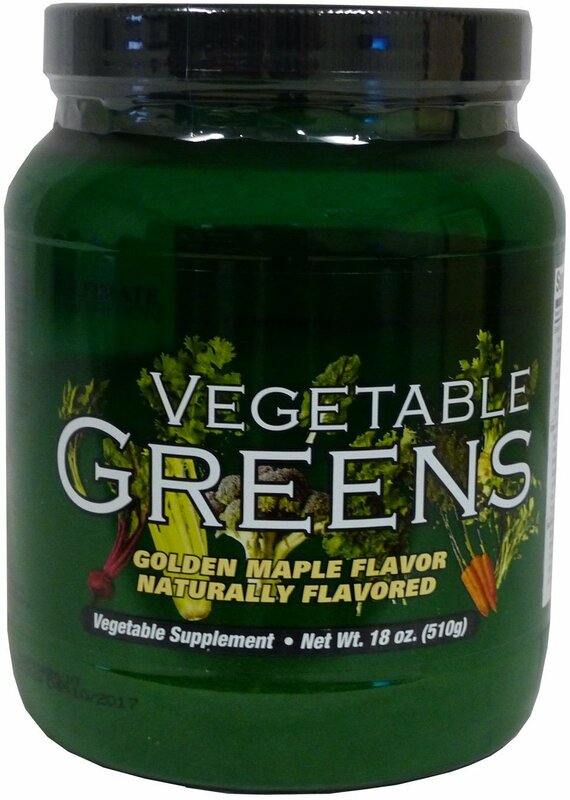 Vegetable Greens contains no artificial flavors, colors, or sweeteners, and has no hidden ingredients. Golden Maple This is a Buy 1 Get 1 FREE offer!